We offer replacement hammers of square grands. The worst problem with old square grands is that many tuners will not tune them. First, they break your back to tune them since the pins and keys are so far apart. Second, it is impossible to get them back better than 85% of new, and even when new, the square grand was quite inferior to grands we have today. They had a poor sound board arrangement. Also, square grands have a clickity clack action in a way, and repairs are like working with tooth picks compared to a sturdy old upright. Having said that, I can still say that I have a good feeling about square grands. There is something primal and original about them. If you have one, there is hope. I shall simply ramble on about this and that to talk about the differences in the square grand as compared with the conventional grand. It would be silly to go over the whole process. When opening the square grand, simply read Chapter Five on Opening the Piano, then read this section to see what is strange in the square grand. Do that with each subject by consulting the Table of Contents. The first thing to consider is that the sound boards cracked quite easily on square grands. If you are not considering a complete restoration, and if the sound board is cracked, simply run a small screw into the crack to stop it from vibrating or buzzing. Use a screw driver that locks into the slot of the screw, and work it down between the wires. Square grands also had trouble with the dampers not coming down on the keys right. Lift the damper right out of the piano along with the one next to it. See if the faulty one is bent. If so, bend it to match the normal one. Also, get some liquid silicone into the felt around the damper wire, BUT, BEWARE, for if you get silicone into a tuning pin nearby, you can kiss that pin goodbye. Squares also will have loose tuning pins. Hammer them in as instructed in previous sections in this chapter. If this doesn't work, consider asking the tuner to simply drop pitch on the square grand as much as two or three half steps. It will end up way below the rest of the world, but you will still have your old toy to show off and plunk on. The tops of squares were made to be very thin. If yours broke, take it off, and take it around to a cabinet shop to be repaired. An alterative is to have a glass shop cut you a very thick piece of window grade plastic to fit on top. Take the hinges along, and ask them to drill the plastic for mounting later. Take the piece of original top along so that they can match the placement of the holes. The plastic top will allow your friends to watch the piano as you play it. It is by far the most facinating piano to watch as it is played. The plastic top will have to be cut in a way to leave the playing area and desk open. You will have to measure very carefully, and it might be best to have the glass shop send a man around to make a pattern. The lyre, or pedal works, on a square is always wobbling. They were pretty light to begin with. Take the lyre clear off, and take it around to a cabinet maker to repair. Once you have it mounted back on the piano, put an old book under it to support it better. If your tuner won't tune it for you, consider selling it and getting a piano that is more conventional. Square grands tend to bring the worst out in people. The owners think they have something very special, when in fact, they have a piece of border line junk. Tuners are fearful that the owner will be mad if things don't go well in repairs or tuning. You must remember that you have a piano which is probably 150 years old, and it is cruel to expect a tuner to make it play right again. I still try, but I charge extra due to the back ache and time playing with the thing. Do not try to tune a square grand unless you have the adapter to go in your tuning lever. They have weird tuning pins. Here is a photo of the dampers on an 1833 Broadman Square Grand. Now, how will you get the dampers to work? These old grands had an improved damper arrangement, and this idea come into universal use on modern grands. But, these dampers will be ringing on if the piano is very old. This innovation became the standard way to activate dampers on modern grands. Look at a modern grand, and you will see the action principles are the same. You will need to remove the action as instructed in Chapter Five, and you should find a way to remove the lower end of the damper wires inside and in the rear of the action cavity. There will probably be a set screw holding the wire in a wood damper action assembly. Remove them all, and you will need to add felt to the dampers. This felt may be soft, but it should be thin I gather. Modern damper felt is very thick. There has to be a kind of felt we have which can be cobbled into the need to work. Another possibility is to loosen the set screw that holds the damper wires, and drop the damper wire (with damper) slightly. If this brings the damper down to rest on the strings and damp them when you play it, you may be able to avoid adding felt. The trick is not to drop the wire too far so that the damper fails to raise when a key is played. Not too much, and not too little. This applies also when you remove the wires and dampers to re-felt them. You will need to set them so that they raise enough but not too much. To re-felt the dampers, remove the old felt. Cut soft but compact felt into strips. You may want both red and white, and make the strips the width of the dampers. Now, lay a piece on the face of the damper, and use a thin but blunt blade to push the red felt into the slot, and follow with white the same way. You will need to insert some Elmer's glue into the slop to hold the felt in place, but do not glue all the way around on the face of the damper. 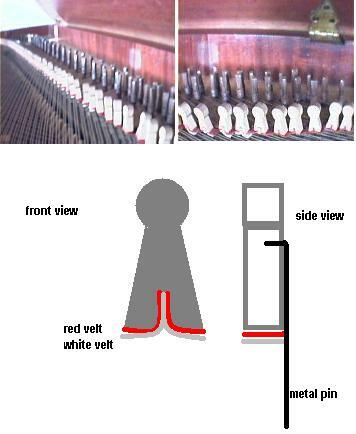 If the felt will not take form and keep it from resting on the strings, glue the red felt to the damper face but not the white.